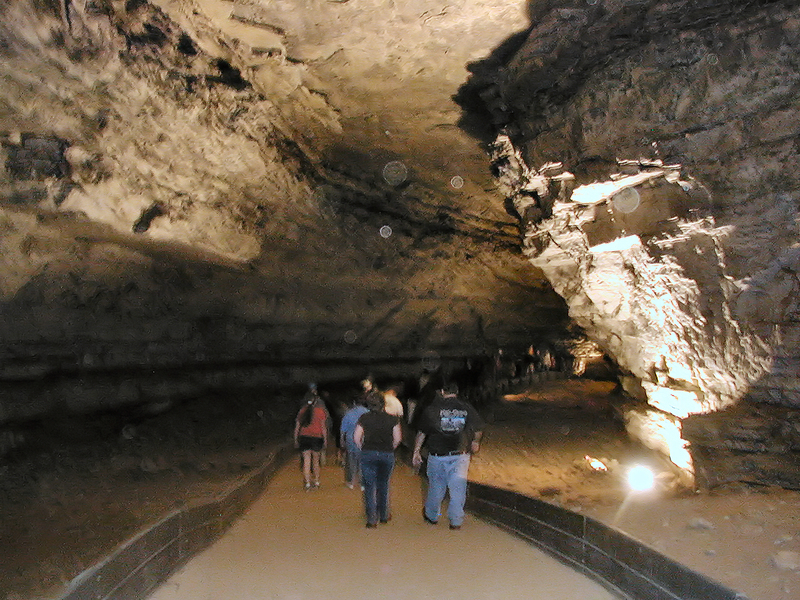 Photos taken during our visit to Mammoth Cave National Park on April 21-22, 2006. The photo above shows the Historic Entrance to Mammoth Cave. 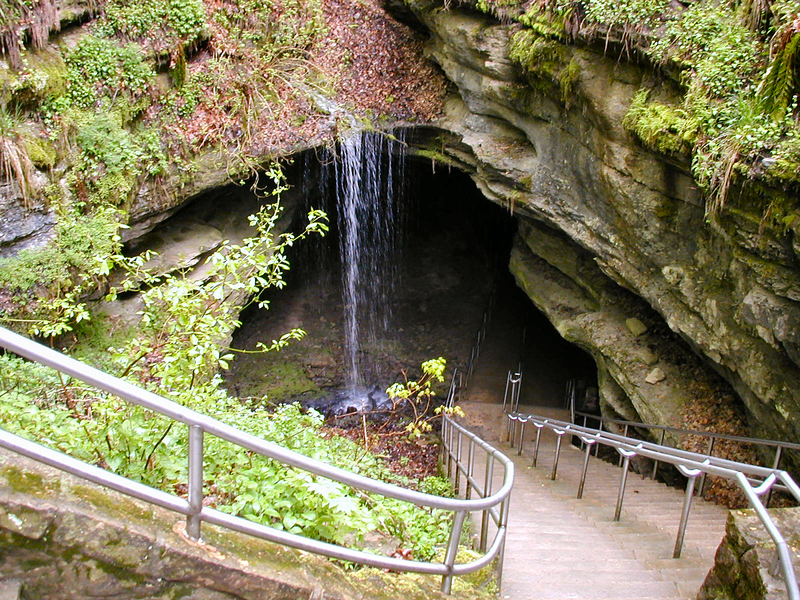 With over 350 miles of surveyed passages, Mammoth Cave is longer than any other known cave. 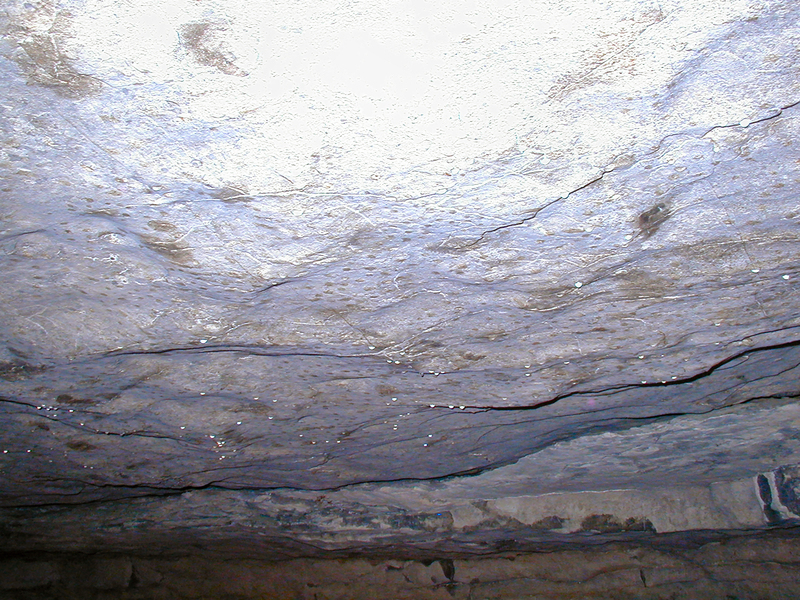 While called a cave, Mammoth is more accurately described as a system of interconnected caves or passages. I have a map on my wall that shows cave passage locations under the park and it looks somewhat like a bad case of varicose veins. The passages twist and turn and branch off from each other in many directions. There are 4 separate levels of the cave, in one area near the historic entrance there are 4 levels of passages one above the other. Evidence of exploration and mining of the cave for minerals by prehistoric men was found in the cave in the form of the spent torches they used for light. Apparently sometime around 2000 years ago the cave was abandoned (or avoided for some reason) and men didn't enter it again until early European settlers moved into the area in the 1780's. The European/Americans immediately saw an opportunity, and began to exploit the cave. 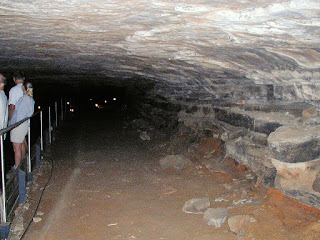 Notably the cave was mined for saltpeter, using slaves for labor, in the early 1800's. The saltpeter was used to make gunpowder. By 1816 the cave was being developed and marketed as a tourist attraction. Slaves that formerly worked the mines now became guides for tourists, and these slaves also did much of the early exploration of the cave passages. 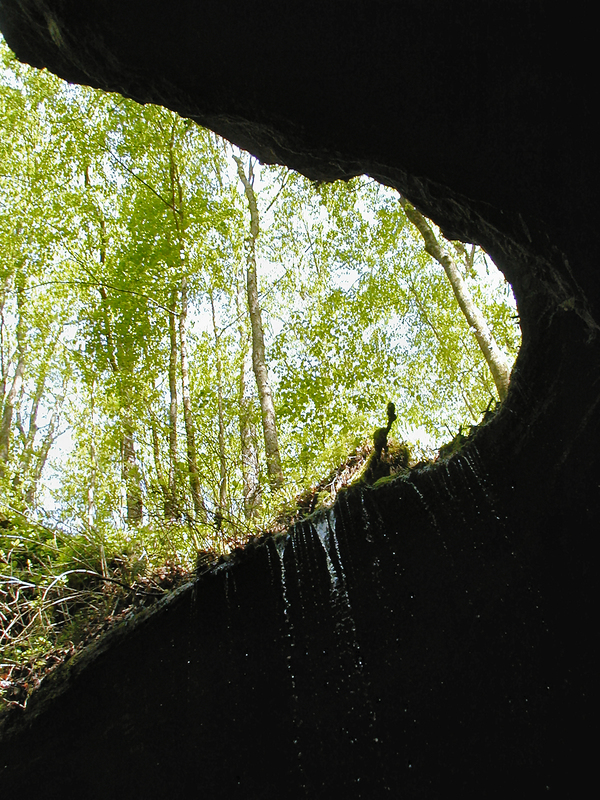 In addition to the cave system, the park includes a 27 mile section of the Green River, ponds, and numerous historical buildings. 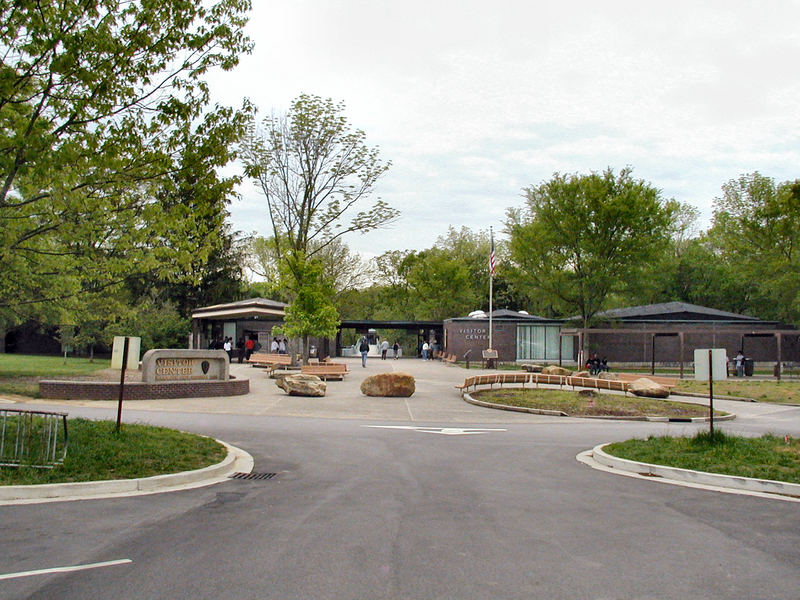 The Mammoth Cave National Park Visitor Center. 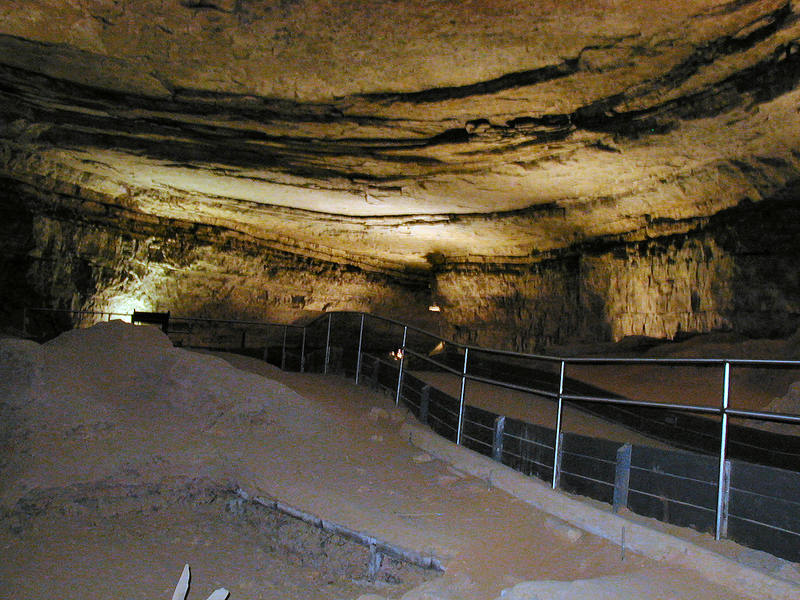 There are many available cave tours. I wasn't feeling very well, I am slightly claustrophobic, and didn't relish the idea of 2 hours trapped on a tour in a cave, so we decided to only take the short, basic "Discovery Tour". Instead of hours spent caving we spent a considerable amount of time exploring the above ground part of the park. To be perfectly honest, we've been in a lot of caves over the years, and they do start to look a lot alike. I know, dedicated spelunkers, that I clearly don't have the proper appreciation of cave variety! Keep in mind my training is in plants, not minerals. Looking up from inside the Historic Entrance. The passage just inside the entrance is called Houchins Narrows. Another look at Houchins Narrows, on the way to the Rotunda room from the cave entrance. The Rotunda room. 140 feet below the surface, it lies directly under the Mammoth Caves Hotel lobby. 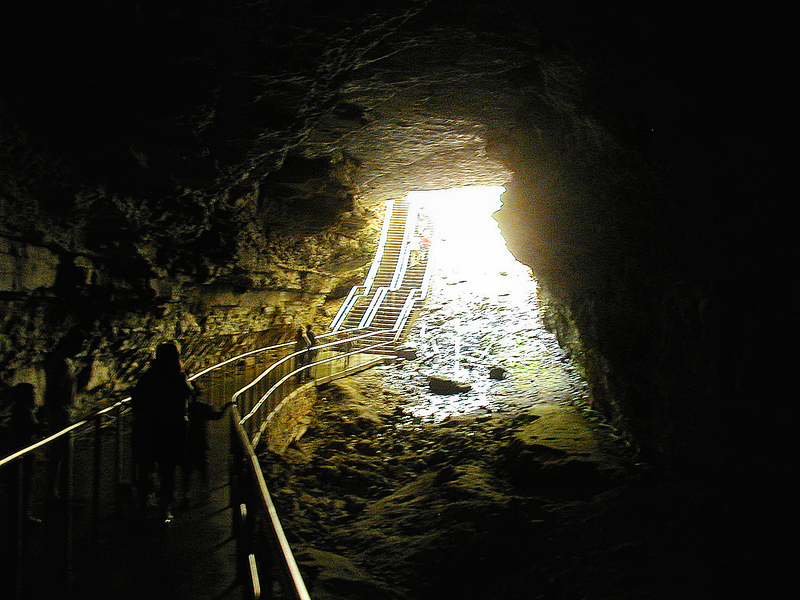 It is tricky to light a cave so human visitors can see, while at the same time making the lights not seem obvious and distracting. 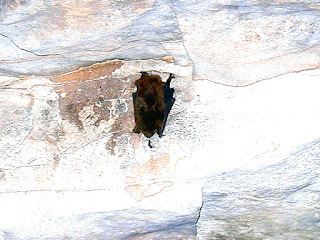 In general lights can not remain on for long periods of time in a cave, or the light will change the cave environment, For example; lights will drive away bats seeking a dark place to roost, or the light can make algae grow in places of the cave where it normally would not and should not. So lights must be designed in separate circuits for each room or passageway, so they can be turned off when visitors are not present. 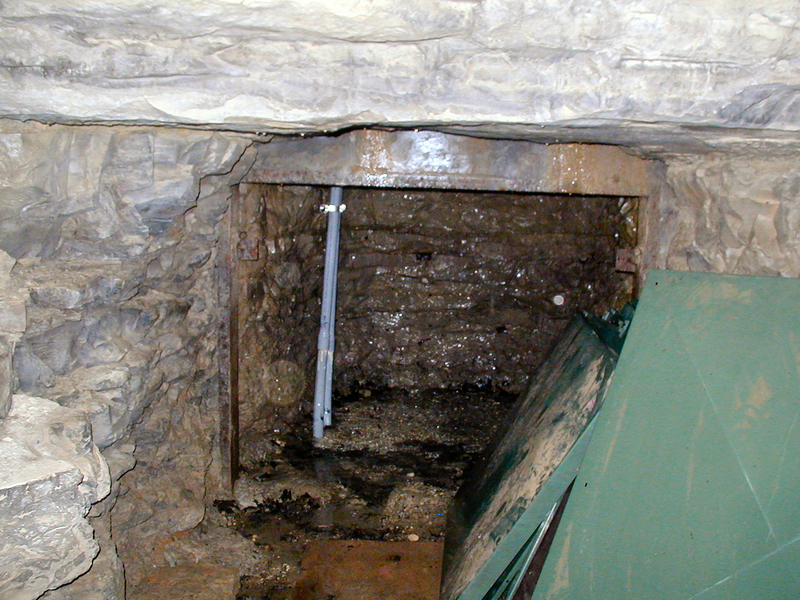 Tunnels are cut in the rock for the wires to go through, but new tunnels can look ugly and can result in air flow changes in the cave. So the man-made tunnels must be sealed off. They were installing new lighting during our visit. 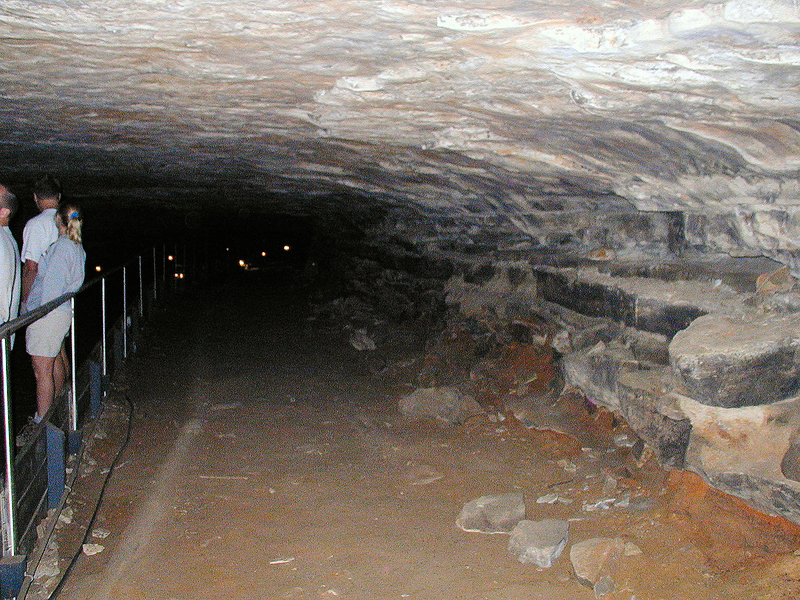 This is a vertical tunnel they drilled to drop the lighting wires down into the cave from the surface. Normally these conduits and the tunnel they run up through would be sealed off by the green metal plates on the right, and then hidden from view with some well-placed rocks. 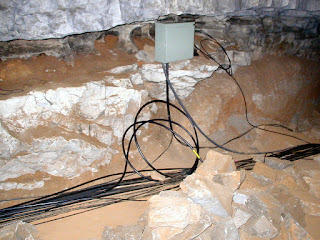 A hint as to the number of wires it takes to light the cave. The wires are in a trench dug into the floor of the cave, and will be buried when finished. In the early 1800's a saltpeter (calcium nitrate) mining operation was set up in the cave, and the large Rotunda room was used for processing the saltpeter. 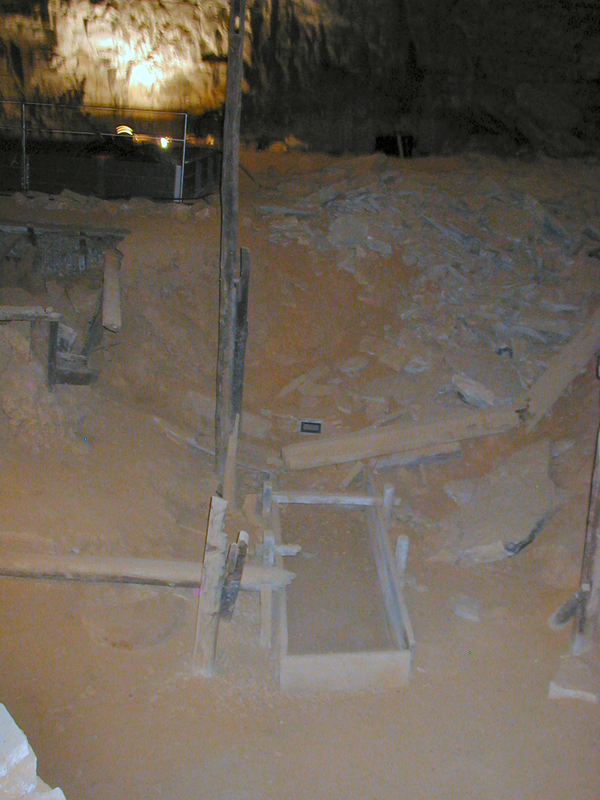 Dirt from the cave floor contains calcium nitrate. 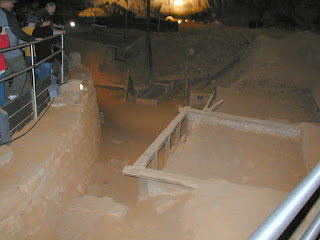 Slaves were used to haul this dirt in carts from other parts of the cave to the Rotunda. 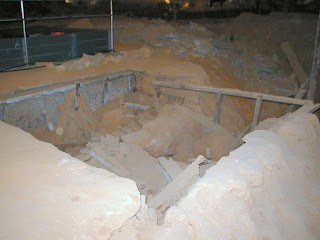 Wood frames were filled with the dirt, then the dirt was leached with water to dissolve and remove the calcium nitrate. 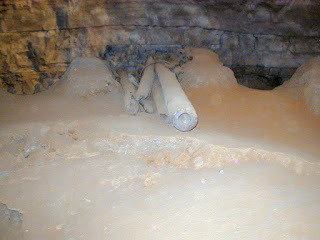 The water used for leaching was piped in from outside of the cave using wood pipes. 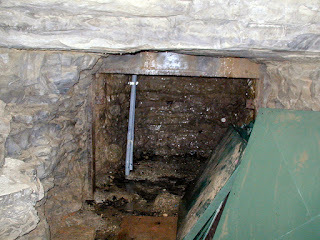 After leaching the soil in the frame, the leach water was collected in pipes under the frame and from there it ran down into wood storage tanks. From the tanks a hand pump was used to pump the water through more wood pipes back out of the cave. You can still see some of the wood pipes on the cave floor in Houchins Narrows between the Rotunda and the historic entrance. Once on the surface, the leach water was further processed to remove impurities by filtering it through barrels filled with wood ash. Finally the remaining filtered water was boiled away, leaving the saltpeter crystals. The saltpeter crystals were packaged and shipped to factories in the Eastern U.S.A., where it was used as an ingredient for making gunpowder. Much of the saltpeter used for making gunpowder for use in the War of 1812 came from Mammoth Cave. The mining operation closed down around 1815 when the end of the war caused a decline in the demand for saltpeter. A wood frame used to leach soil in the Rotunda. Another wood leaching frame. In the background you can see the collection tank for the leach water. A close up of the tank is in the photo below. A collection tank for the leach water running out of the wood frame above. Note the wood pipe to carry the water from the bottom of the frame to the wood collection tank. Closer view of a section of the wood pipe that was used to transport water into the cave for the saltpeter mining. 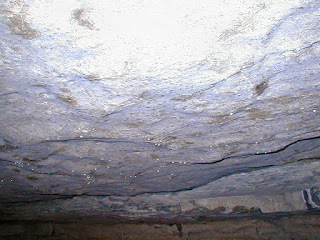 Water droplets reflect the light on the cave ceiling. 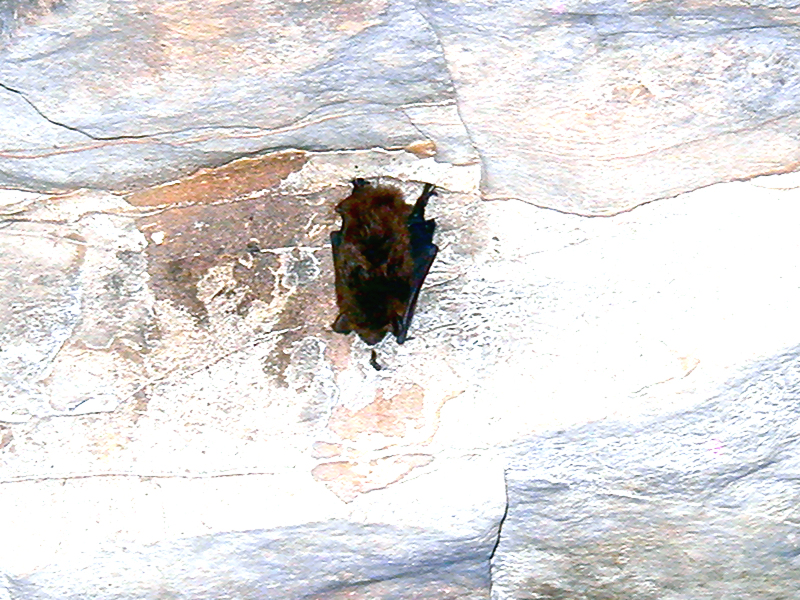 A bat hanging upside down from the ceiling of the cave. Audubon Avenue is a large passage that is adjacent to the Rotunda. While the cave is the main attraction for Mammoth Cave National Park, the scenery on ground level throughout the park is also very lovely. See the next page for Free Stock Photos of the Landscape around Mammoth Caves as well as more commentary.